The A5 size Journal is published four times a year, usually in February, May, July and November. Each issue usually contains a number of main articles which can cover a wide range of topics, from the purely historical to personal recollections. 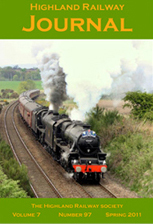 Locomotives, carriages wagons, signalling, track layouts and train working have all featured. The particular problems faced by operating a railway in the Highlands, from winter snow to summer tourists have been described. The strong modelling interest among members is reflected in some of the contributions, whether it be the intricacies of building a Jones chimney or a doulbe deck sheep van or advice on how to complete the latest kit on the market. Articles for each issue are selected to give a balance between all these differing interests. The Journal includes a number of regular features such as news from the line, details of forthcoming Society activities and information on all the latest model kits and components. Members queries often lead to lengthy discussions. And if there is any room left, interesting snippets from the past provide a little light relief. The full run of Journals is available digitally in Acrobat form to members. An index is available for issues 1 to 112 in pdf format.